Considered as one the World’s best hikes by National geographic.. Enjoy snow-capped mountains views of Cusco, Vilcabamba & Urubamba mountain range.. Discover the mystical beauty of Machu Picchu, the crown jewel of the Inca Empire.. Opportunity to see beautiful landscapes with a variety of endemic flora and fauna.. Spend time exploring the former Inca capital of Cusco and its surrounding..
An amazing 8 days culturally rich and rewarding travel experience in Peru.. Hike up and over Salkantay Pass for breathtaking views of the valley below. Enjoy the lesser-trekked route to Mount Salcantay before joining up with the classic Inca Trail. 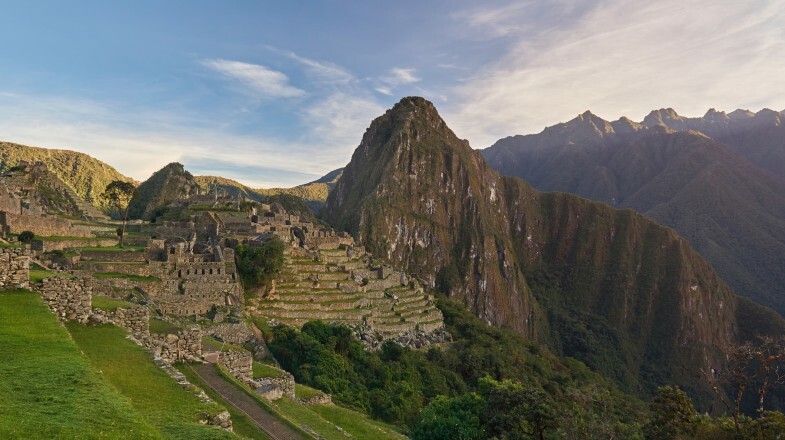 Explore the iconic ‘lost city’ of Machu Picchu at the best time of day. Trek among the lush valleys, alpine lakes and rugged snow-capped peaks of the Peruvian Andes. Visit the salt mines at Maras. Tour Machu Picchu; the mountain-crowning Incan citadel. A trip to Machu Picchu is a must while visiting Peru. These majestic Incan ruins nestling among the clouds on their high mountain perch is famous all around the world. ‘Rediscovered’ in 1911 by Hiram Bingham, Machu Picchu has still not given up all its secrets and archaeologists are divided over its original signification and use. This mysterious site high in the Andes leaves few visitors unmoved and can be reached via famous trekking routes in Peru like the Inca trail, Salkantay trek and Choquequirao Trek. Arrive at Machu Picchu on foot after hiking the four-day Inca Trail. Alternatively, base yourself at Aguas Calientes (Machu Picchu Pueblo), arriving after a spectacular train journey through the mountains. Travel up to the ruins in time to catch the sunrise at Machu Picchu. Look out for highlights among the ruins themselves including the Temple of the Sun, the Room of the Three Windows, Intihuatana and the Sun Gate. Climb Huayna Picchu, the peak at the northern end of the ruins, for views of Machu Picchu. Visitors to Machu Picchu are limited to 2,500 per day so book ahead to avoid disappointment, especially at the busiest times. Only 400 people are permitted to climb Huayna Picchu per day so you will need to arrive early. This means queuing for the first bus from Aguas Calientes before 4.30am. Follow the vertiginous trail down from Huayna Picchu to see the less-visited Temple of the Moon. If you are unable to obtain a ticket for Huayna Picchu, climb Cerro Picchu to the south instead. You will be rewarded by great views and fewer crowds. If you want to avoid the overcrowded Inca Trail, you can take on the alternative Salkantay Trek which offers views of Machu Picchu from above before arriving at Aguas Calientes for a visit of the ruins the next day. Take insect repellent and be prepared for both sun and rain even in dry season. Machu Picchu has seasonal weather so please do check up on the best time to visit Machu Picchu before planning your tour. If you’re still hunting for more things to do and places to explore in Peru, do check out our Peru Travel Guide for more information.